Create data set content on a recurring schedule. You can schedule the automatic creation of data set content by specifying a trigger when you call CreateDataset (triggers:schedule:expression). Data which has arrived in a specified data store is used to create the data set content, with the fields you want selected by a SQL query (actions:queryAction:sqlQuery). You can also define a non-overlapping, contiguous time interval that ensures the new data set content contains only that data which has arrived since the last time. Use the actions:queryAction:filters:deltaTime and :offsetSeconds fields to specify the delta time interval. As before, you also specify the trigger that creates the data set content when the time interval has elapsed. See Example 6 -- Creating a SQL dataset with a Delta Window (CLI):. Create data set content upon completion of another data set. You can trigger creation of new data set content upon completion of another data set's content creation (triggers:dataset:name). Automatically run your analysis applications. You have a system with a smart valve that measures pressure, humidity and temperature. The system collates events on a periodic basis and also upon certain events such as valve open and close. With IoT Analytics, you can automate an analysis that would aggregate the non-overlapping data within these periodic windows and create KPI reports on end-product quality. After processing each product batch, you can measure the overall product quality and lower your operational expenditure through maximized run volume. You run analytics (algorithm, data science or ML for KPI) every 15 minutes on data generated by 100s of devices, with each analytics cycle generating and storing state for next analytics run. For each of your analyses, you want to use only that data received within a specified time window. With IoT Analytics you can orchestrate your analyses and create the KPI and report for each run then store the data for future analytics. IoT Analytics allows you to automate your anomaly detection workflow that you manually have to run every 15 minutes on new data which has arrived in a data store. You can also automate a dashboard that shows device usage and top users within a specified period of time. You have industrial production lines. Using the data sent to IoT Analytics, including available process measurements, you can operationalize the analytical workflows to predict process outcomes. Data for the model can be arranged in an M x N matrix where each row contains data from various time points where laboratory samples are taken. IoT Analytics helps you operationalize your analytical workflow by creating delta windows and using your data science tools to create KPIs and save the state of the measurement devices. This section includes informaton about how to build your own Docker container. There is a security risk if you re-use Docker containers built by third parties: these containers can execute arbitrary code with your user permissions. Make sure you trust the author of any third-party container before using it. Create a Docker container that contains your data application plus any required libraries or other dependencies. 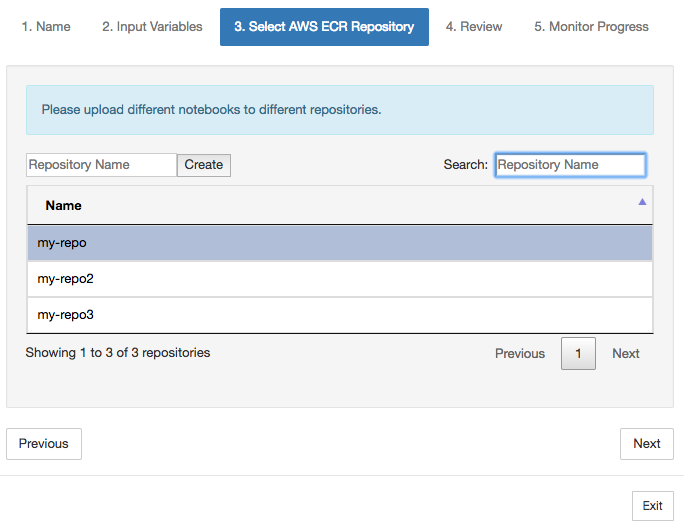 Upload the container to an Amazon ECR registry. Create a channel where the messages are sent (iotanalytics:CreateChannel). Create a pipeline to connect the channel to the data store (iotanalytics:CreatePipeline). Create an IAM role that grants permission to send message data to an AWS IoT Analytics channel (iam:CreateRole). Create an IoT rule that uses a SQL query to connect a channel to the source of the message data (iot:CreateTopicRule field topicRulePayload:actions:iotAnalytics). When a device sends a message with the appropriate topic via MQTT, it is routed to your channel. Or, you can use iotanalytics:BatchPutMessage to send messages directly into a channel from a device capable of using the AWS SDK or CLI. Create a SQL data set whose creation is triggered by a time schedule (iotanalytics:CreateDataset, field trigger:schedule) denoting the desired interval of N minutes/hours for data collection. You specify a query action with the appropriate SQL query to select the data fields you want (field "actions:queryAction:sqlQuery). The ARN of the docker container stored in your account (image). The ARN of the role which gives permission to the system to access needed resources in order to run the container action (executionRoleArn). The configuration of the resource that executes the container action (resourceConfiguration). The type of the compute resource used to execute the container action (computeType with possible values: ACU_1 [vCPU=4, memory=16GiB] or ACU_2 [vCPU=8, memory=32GiB]). The size (in GB) of the persistent storage available to the resource instance used to execute the container action (volumeSizeInGB). The values of variables used within the context of the execution of the application (basically, parameters passed to the application) (variables) . These variables are replaced at the time a container is executed. This allows you to run the same container with different variables (parameters) which are supplied at the time the data set content is created. 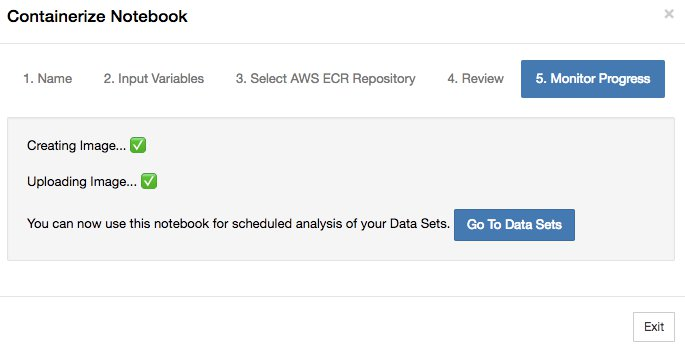 The IotAnalytics Jupyter extension simplifies this process by automatically recognizing the variables in a notebook and making them available as part of the containerization process. You can choose the recognized variables or add custom variables of your own. Before it runs a container, the system replaces each of these variables with the value current at the time of execution. One of the variables is the name of the data set whose latest content is used as input to the application (this is the name of the data set you created in the previous step) (datasetContentVersionValue:datasetName). Another variable specifies an output file URI where the output data set's content is stored (usually the URI of a file in an S3 bucket (outputFileUriValue:filename). With the SQL query and delta window to generate the data set, and the container with your application, IoT Analytics creates a scheduled production data set that runs at the interval you specify on data from the delta window, producing your desired output and sending notifications. You can pause your production data set application and resume it whenever you choose to do so. When you resume your production data set application, IoT Analytics, by default, catches up all the data that has arrived since last execution, but hasn't been analyzed yet. You can also configure how you want to resume your production data set job besides the default catch up option. You can catch up in multiple fixed-length windows (as defined by your delta window length) by performing a series of consecutive runs. Alternatively, you can resume your Production data set application by capturing only the newly arrived data that fits within the specified size of your delta window. This option skips any data beyond the length of your delta window. Only container data sets can be triggered by SQL data sets. A SQL data set can trigger at most 10 container data sets. "Triggering dataset can only be added on a container dataset"
"There can only be one triggering dataset"
This error occurs if you attempt to define a container data set which is triggered by two different SQL data sets. "The triggering data set <dataset-name> cannot be triggered by a container dataset"
This error occurs if you attempt to define a container data set which is triggered by another container data set. "<N> datasets are already dependent on <dataset-name> dataset"
This error occurs if you attempt to define another container data set which is triggered by a SQL data set which already triggers 10 container data sets. "Exactly one trigger type should be provided"
This error occurs is you attempt to define a data set which is triggered by both a schedule trigger and a data set trigger. This section demonstrates how the program which is run by your custom Docker image may read input variables and upload its output. In addition to the name and version ID of your dataset, the Variables section contains the variables specified in the iotanalytics:CreateDataset invocation-- in this example, a variable example_var was given the value hello world!. A custom output URI was also provided in the custom_output variable. The OutputUris field contains default locations to which the container can upload its output-- in this example, default output URIs were provided for both ipynb and html output. You must create two roles. One role grants permission to launch a SageMaker instance in order to containerize a notebook. Another role is needed to execute a container. A list of actions that create the data set's content. The name of the data set action by which the data set's content is automatically created. An "SqlQueryDatasetAction" object that uses an SQL query to automatically create the data set's content. Pre-filters applied to message data. The number of seconds of estimated "in flight" lag time of message data. When you create the data set content using message data from a specified time frame, some message data may still be "in flight" when processing begins, and so will not arrive in time to be processed. Use this field to make allowances for the "in flight" time of your message data, so that data not processed from a previous time frame will be included with the next time frame. Without this, missed message data would be excluded from processing during the next time frame as well, because its timestamp places it within the previous time frame. Information which allows the system to run a containerized application in order to create the data set content. The application must be in a Docker container along with any needed support libraries. The ARN of the Docker container stored in your account. The Docker container contains an application and needed support libraries and is used to generate the data set content. The ARN of the role which gives permission to the system to access needed resources in order to run the "containerAction". This includes, at minimum, permission to retrieve the data set content which is the input to the containerized application. Configuration of the resource which executes the "containerAction". The values of variables used within the context of the execution of the containerized application (basically, parameters passed to the application). Each variable must have a name and a value given by one of "stringValue", "datasetContentVersionValue", or "outputFileUriValue". The value of the variable as a structure that specifies the version of the data set's content. The name of the data set whose latest content is used as input to the notebook or application. The URI of the location where the data set's content is stored, usually the URI of a file in an S3 bucket. A list of triggers. A trigger causes the data set's content to be populated at a specified time interval or when another data set's content is created. The list of triggers can be empty or contain up to five DataSetTrigger objects. The "Schedule" when the trigger is initiated. The expression that defines when to trigger an update. 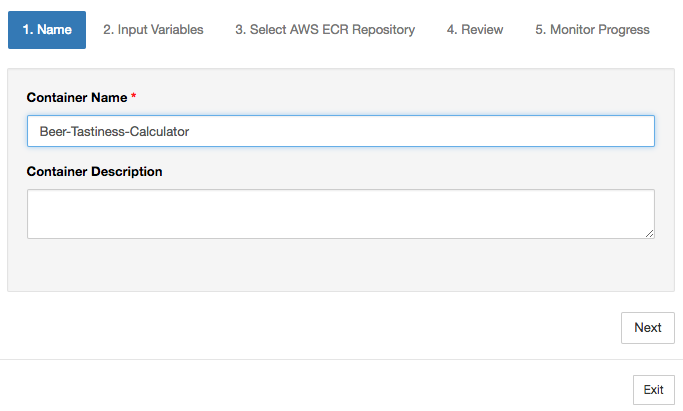 For more information, see Schedule Expressions for Rules in the Amazon CloudWatch Events User Guide. The data set whose content creation triggers the creation of this data set's content. The name of the data set whose content generation triggers the new data set's content generation. When the data set content is created it is delivered to destinations specified here. The destination to which the data set content is delivered. 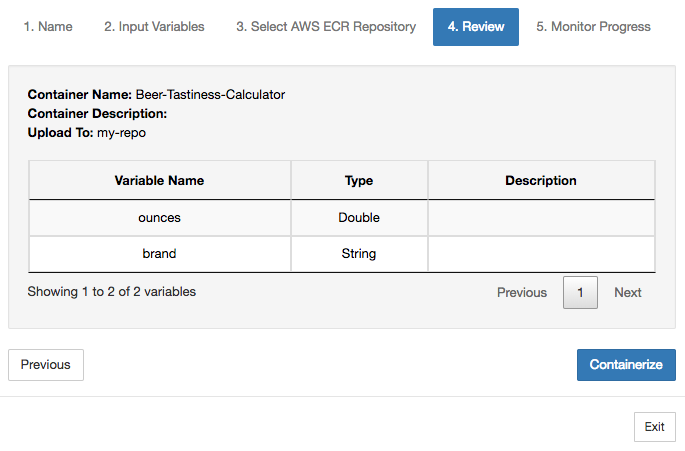 Configuration information for delivery of the data set content to AWS IoT Events. The name of the AWS IoT Events input to which the data set content is delivered. The ARN of the role which grants AWS IoT Analytics permission to deliver data set content to an AWS IoT Events input. If true, unlimited versions of data set contents will be kept. How many versions of data set contents will be kept. The "unlimited" parameter must be false. Metadata which can be used to manage the data set. How long, in days, data set contents are kept for the data set. Delta windows are a series of user-defined, non-overlapping and contiguous time intervals. Delta windows allow you to create data set content with, and perform analysis on, new data that has arrived in the data store since the last analysis. You create a delta window by setting the deltaTime in the filters portion of a queryAction of a data set (CreateDataset). Usually, you'll want to create the data set content automatically by also setting up a time interval trigger (triggers:schedule:expression). Basically, this allows you to filter messages that have arrived during a specific time window, so the data contained in messages from previous time windows doesn't get counted twice. In this example, we create a new data set that automatically creates new data set content every 15 minutes using only that data which has arrived since the last time. We specify a 3 minute (180 second) deltaTime offset that allows for a delay of 3 minutes for messages to arrive in the specified data store. So, if data set content is created at 10:30AM, the data used (included in the data set content) would be that with timestamps between 10:12AM and 10:27AM (that is 10:30AM - 15 minutes - 3 minutes to 10:30AM - 3 minutes). "expression": "cron(0/15 * * * ? *)"
This section includes informaton about how to build a Docker container using a Jupyter notebook. There is a security risk if you re-use notebooks built by third parties: included containers can execute arbitrary code with your user permissions. In addition, the HTML generated by the notebook can be displayed in the IoT Analytics console, providing a potential attack vector on the computer displaying the HTML. Make sure you trust the author of any third-party notebook before using it. One option to perform advanced analytical functions is to use a Jupyter Notebook. Jupyter Notebooks provide powerful data science tools that can perform machine learning and a range of statistical analyses. For more information, see Notebook Templates. (Note that we do not currently support containerization inside JupyterLab.) You can package your Jupyter Notebooks and libraries into a container that periodically runs on a new batch of data as it is received by AWS IoT Analytics during a delta time window you define. You can schedule an analysis job that uses the container and the new, segmented data captured within the specified time window, then stores the job’s output for future scheduled analytics. If you have created a SageMaker Instance using the Iot Analytics console after August 23, 2018, then the installation of the containerization extension has been done for you automatically and you can begin creating a containerized image. 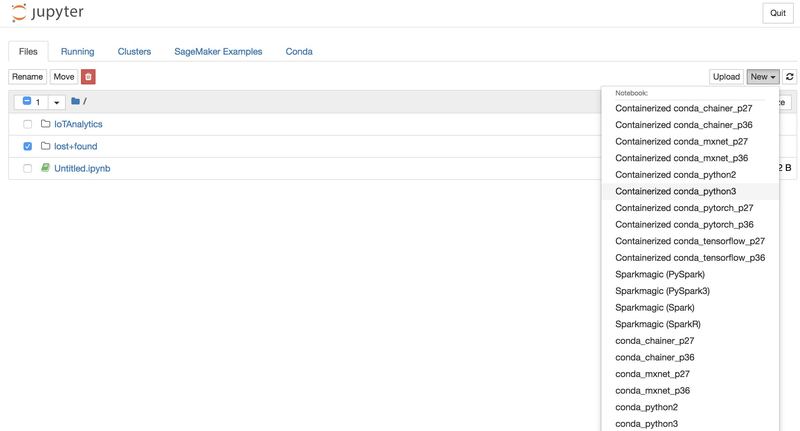 Otherwise, follow the steps listed in this section to enable notebook containerization on your SageMaker instance. 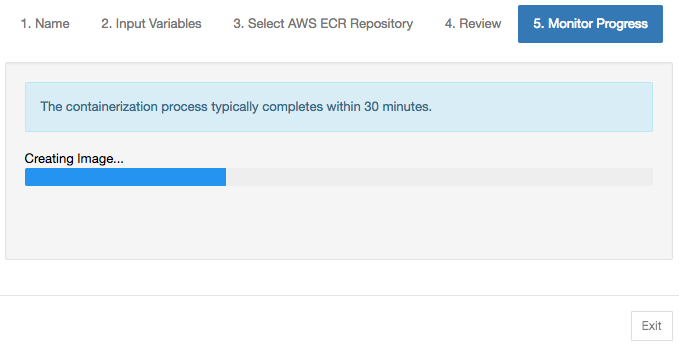 In what follows, you modify your SageMaker Execution Role to allow you to upload the container image to AWS ECR and you install the containerization extension. We recommend that you create a new SageMaker instance via the Iot Analytics console instead of following these steps. New instances automatically support containerization. If you restart your SageMaker instance after enabling containerization as shown here, you won't have to re-add the IAM roles and policies, but you must re-install the extension, as shown in the final step. Choose Attach Policy, then define and attach the policy shown in Permissions. You also must download the containerization code from S3 and install it on your notebook instance. The first step is to access the SageMaker instance's terminal. Inside the terminal, enter the following commands to download the code, unzip it, and install it. Note that these commands kill any processes being run by your notebooks on this SageMaker instance. Wait for a minute or two for the extension to be validated and installed. If you created your SageMaker Instance via the Iot Analytics console after August 23, 2018, then the containerization extension was installed automatically. You can update the extension by restarting your instance from the SageMaker Console. If you installed the extension manually, then you may update it by re-running the terminal commands listed in Enable Containerization Of Notebook Instances Not Created Via Iot Analytics Console. In this section we show the steps necessary to containerize a notebook. To begin, go to your Jupyter Notebook to create a notebook with a containerized kernel. You are presented with with an overview summarizing your input. Note that after you have started the containerization process you cannot cancel it. The process may last for over an hour. Choose containerize to begin the containerization process. If you accidentally close your browser, you can monitor the status of the containerization process from the Notebooks section of the IoT Analytics console. You can create your own custom container and run it with the IoT Analytics service. 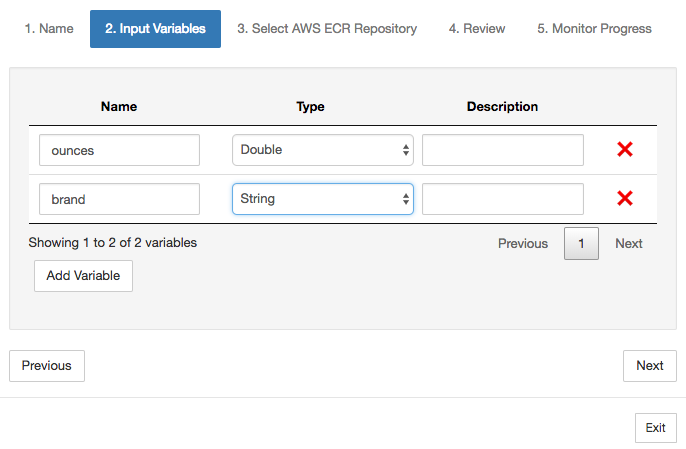 To do so, you setup a Docker image and upload it to Amazon ECR, then set up a data set to run a container action. This section gives an example of the process using Octave. Dockerfile - The initial setup for Docker's containerization process. run-octave.py - Parses JSON from IoT Analytics, runs the Octave script, and uploads artifacts to S3. moment - A simple Octave script which calculates the moment based on an input/output file and a specified order. Download the contents of each file. Create a new directory and place all the files in it. Then cd to that directory. docker build -t octave-moment . Create a new S3 Bucket called "octave-sample-data-<your-account-id>". Upload the file "input.txt" to the S3 Bucket you just created. You should now have a bucket named octave-sample-data-<your-aws-account-id> containing the file input.txt. You may need to wait several minutes until the DatasetContentState is SUCCEEDED.